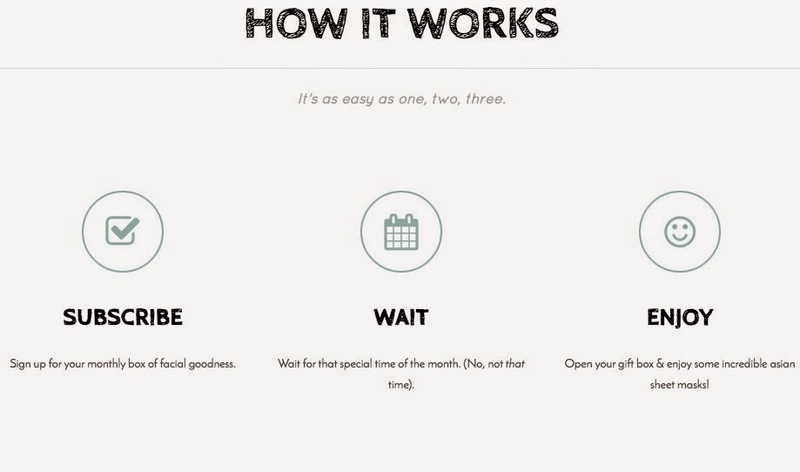 Econobum #ClothDiaper Kit #FluffyXmas #Giveaway - A $65 value! Welcome to the greatly anticipated 5th annual Merry Fluffy Christmas Giveaway Event!! There are over 20 blogs that are giving away cloth diapering prize packages $50 and more! Make sure you enter here and then hop to all the others!! There are hundreds in fluffy prizes to be won! This year, there are also two HUGE Grand Prize packages, on both of the host blogs, And Then There Were 5 and Mommy’s Favorite Things! So make sure you enter to win those as well! Good luck! This year, Baby and the Chi's blog is giving away a starter kit for any new cloth-diapering mom - an Econobum full cloth diapering kit! This kit includes everything you need to get started in your cloth diapering journey, and the natural organic cotton is easy to wash and keep clean. Enter to win this kit via the widget below! I'm a sucker for subscription boxes as well as sheet masks. So when I heard about a subscription service that offers only sheet masks in their boxes, I had to try them out. 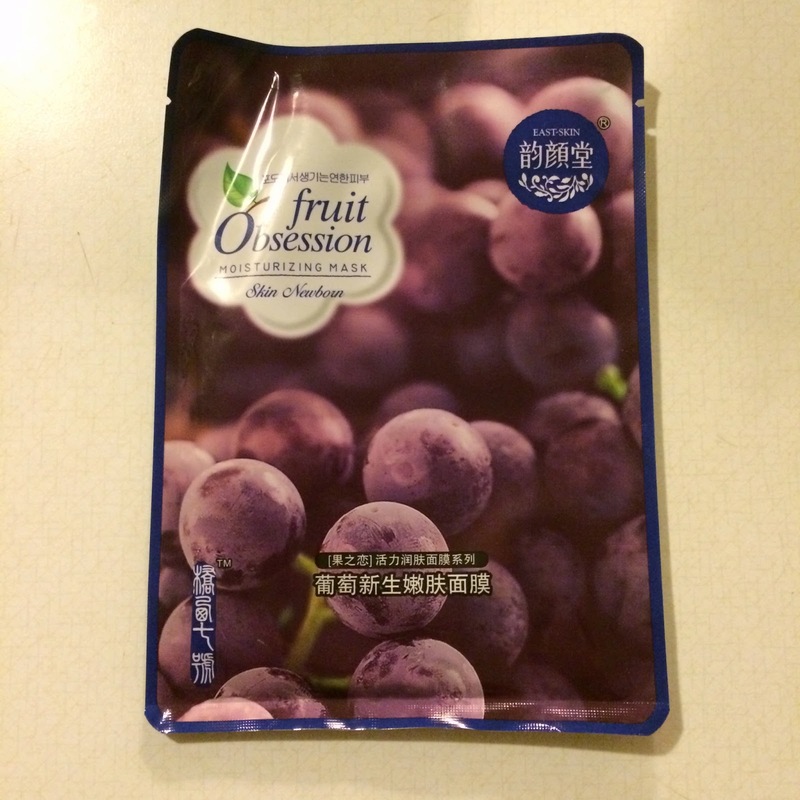 That's how I found "Oh Sheet Mask." 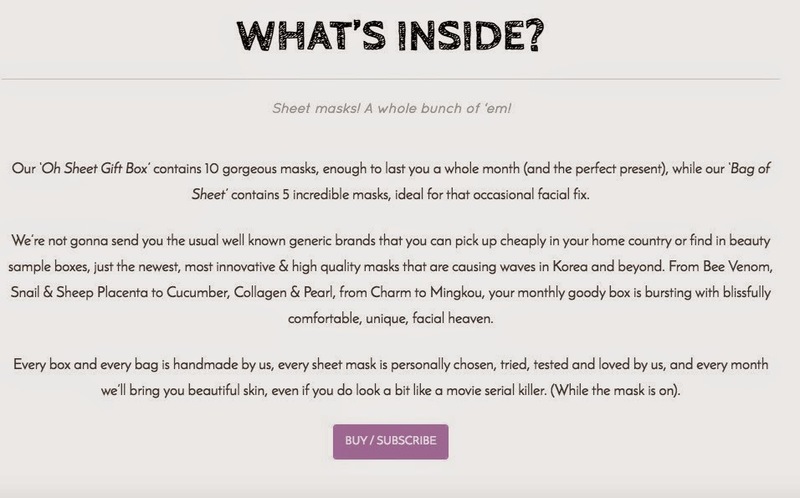 Oh Sheet Mask is a subscription box service that boasts being able to provide high quality asian sheet masks that are new and innovative - masks "that are causing waves in Korea and beyond." These statements alone, taken from both their website and their Facebook page couldn't get me to hit that subscribe button fast enough. 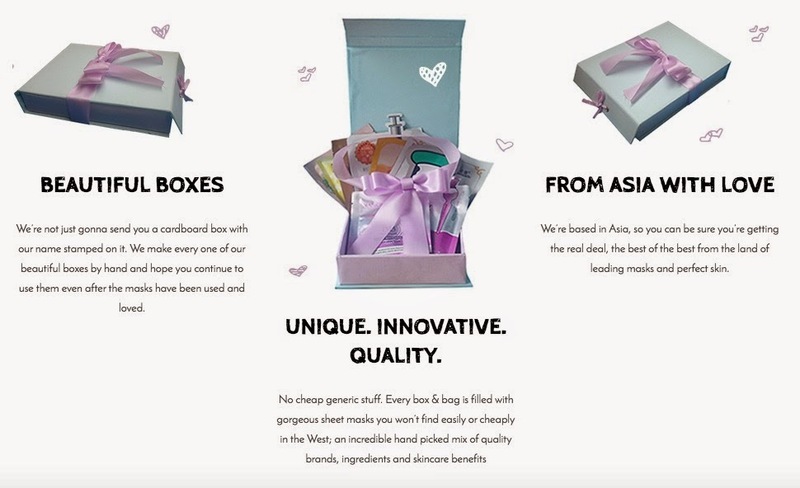 Oh Sheet Mask offers several different types of boxes; including a monthly or single-time purchase 10 sheet box for $23 and a monthly or single-time purchase 5 sheet bag for $11. These prices include shipping, which is available worldwide. There is currently also a "Festive Gift Box" which includes 10 sheet masks for $23, including new and past masks (from subscription boxes) wrapped in a Christmas-y gift box - making it perfect for a gift, or a sweet holiday treat to yourself. 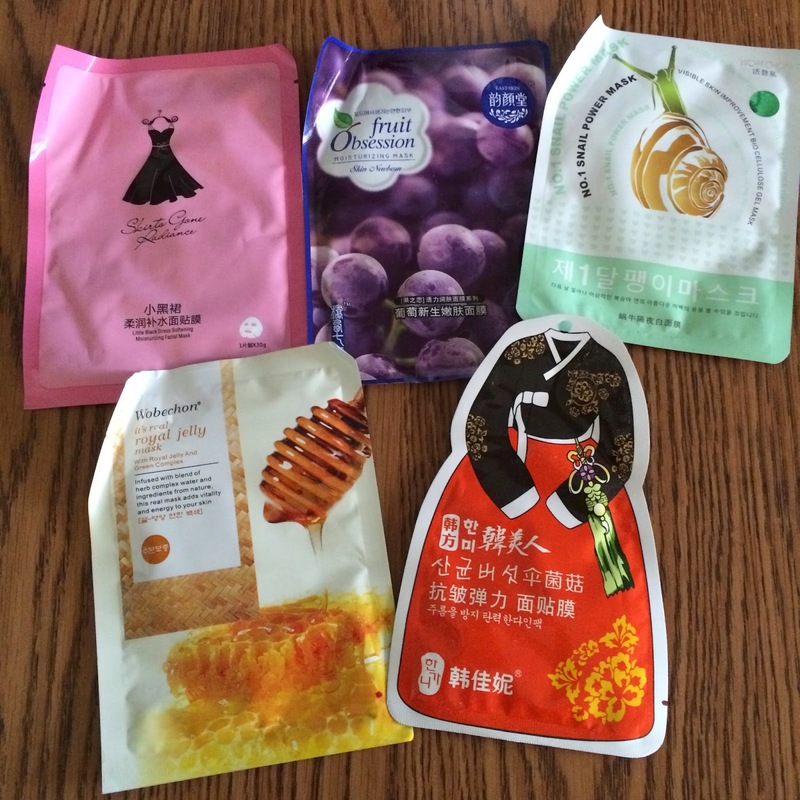 I purchased the $11 bag containing 5 sheet masks, and signed up for a recurring monthly subscription. The price per mask comes out to be $2.20 each with free shipping. A bit higher than I usually pay, but for unique masks that I've probably never seen before, this price is totally worth it. (Just an FYI- the $23 box works out to cost $2.30 per mask, so while you receive more, the bag is a better deal price-wise, unless you're looking for that cute box of course). 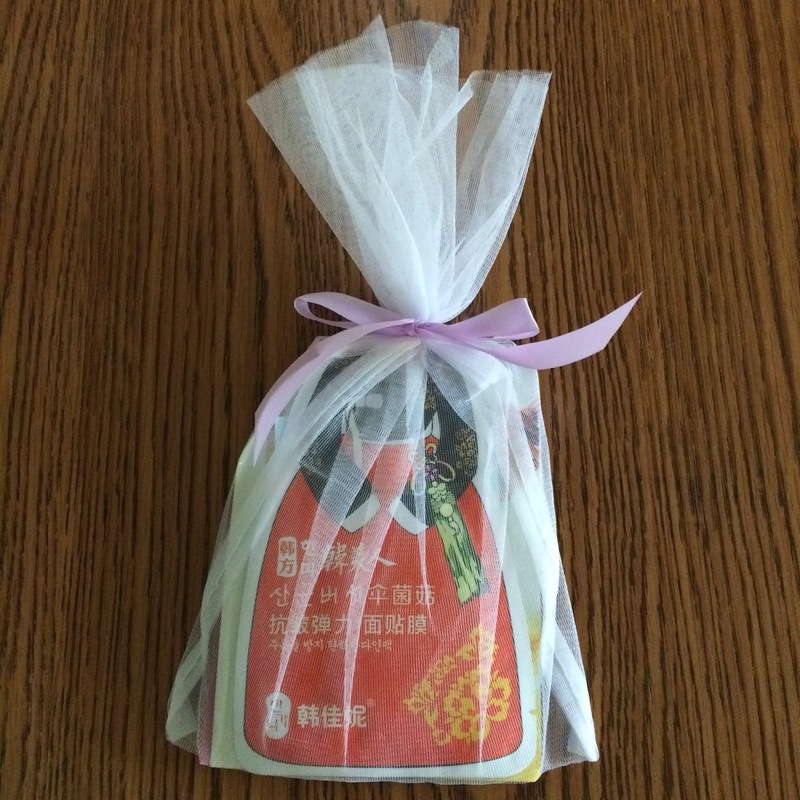 I received 5 masks in a cute mesh bag, tied together with a ribbon. The card included with the masks. Only two ingredients came up unknown which were the generalization of "spices" and the ingredient "silk dope" which is artificial spider silk. Several ingredients came up with a low chance of causing acne or irritating the skin, which did make mer nervous about any reactions I may have to this mask. This mask ended up being very moisturizing and calming to my face. I loved it! This ingredient list is little scary with the amount of repeated ingredients and the use of a preservative as a second ingredient. 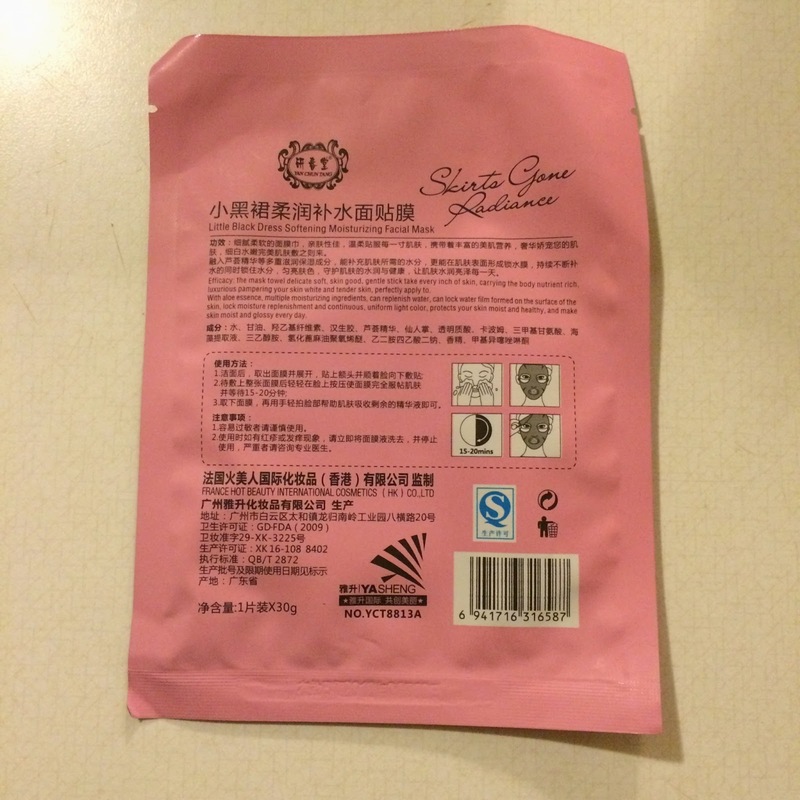 However, there is really nothing bad (acne or irritant wise) to say about the ingredients of this mask. I experienced mild itching while this mask was on my face, but it went away once the mask was removed. My face appeared a little brighter once I removed the mask, but there were otherwise no real results to speak of. The "Newborn Skin Rejuvenation Cream" listed as an ingredient is odd. There are also a few items that could potentially cause acne, but they are not immediate on the list so I hoped for the best. 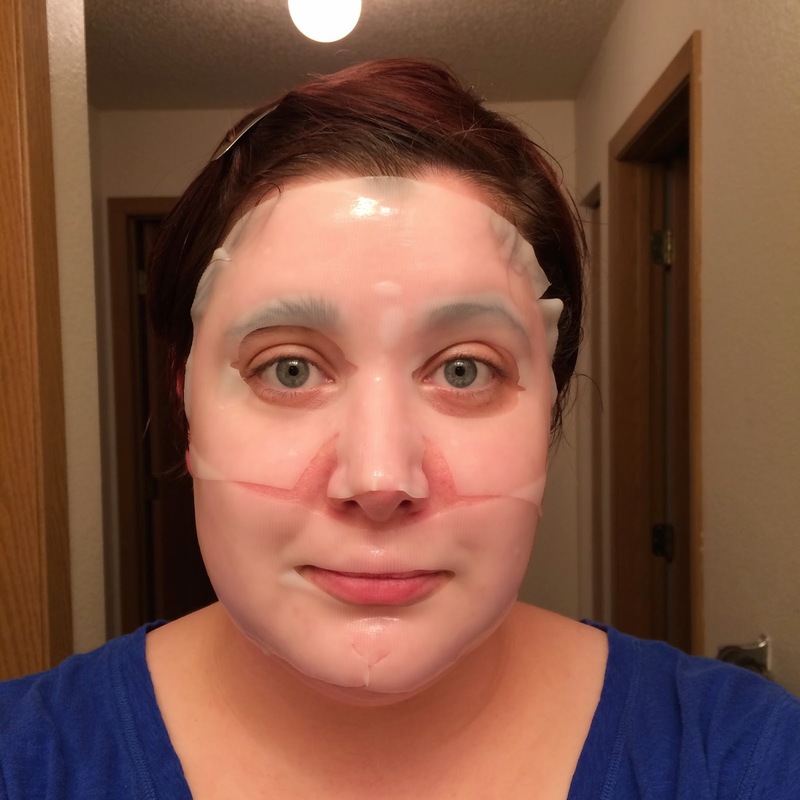 Unfortunately this mask caused itching and redness during and immediately following use. 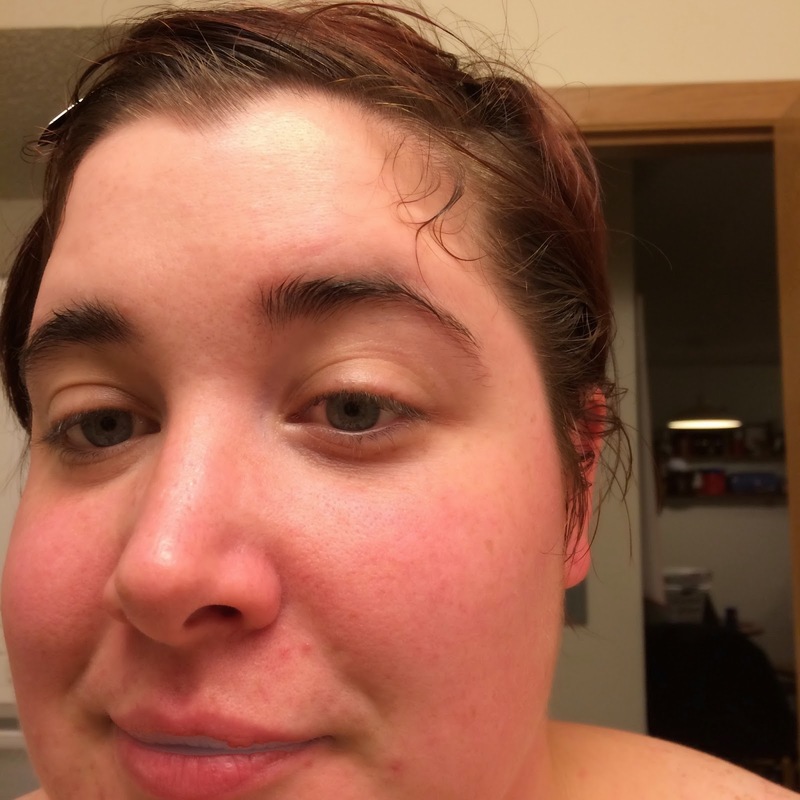 At first the redness died down and my face looked lighter and bright, but then my face started to feel very hot and tight. 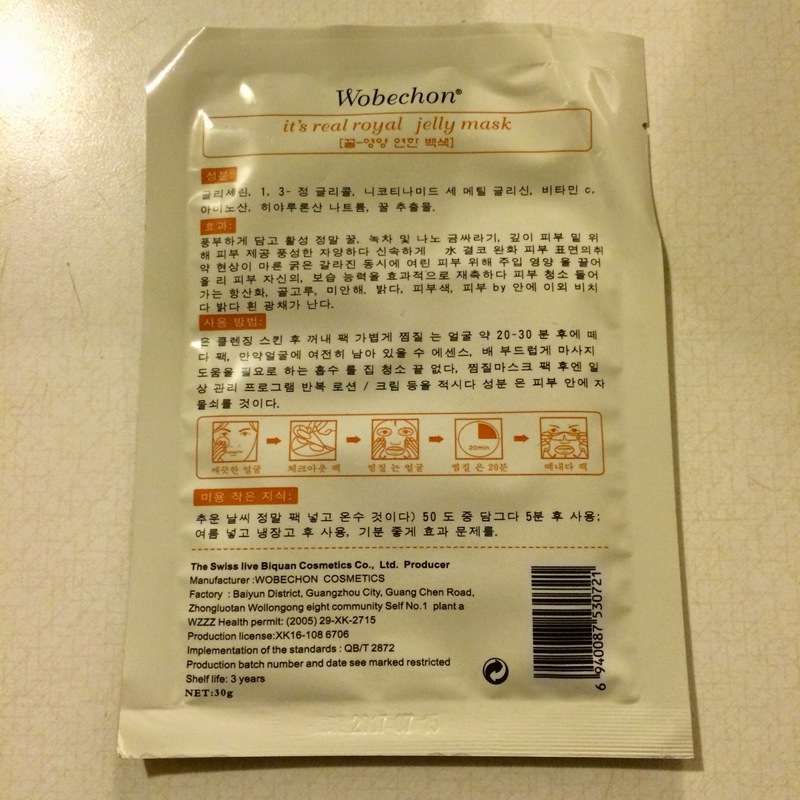 I experienced extreme redness, itching, and some swelling until shortly after an hour after I removed the mask when I washed my face and applied an aloe vera mask. This mask left an oily residue on my face, which I assume is caused by the generic "Palmitic Filtrate" (which is plant or animal derived oil). 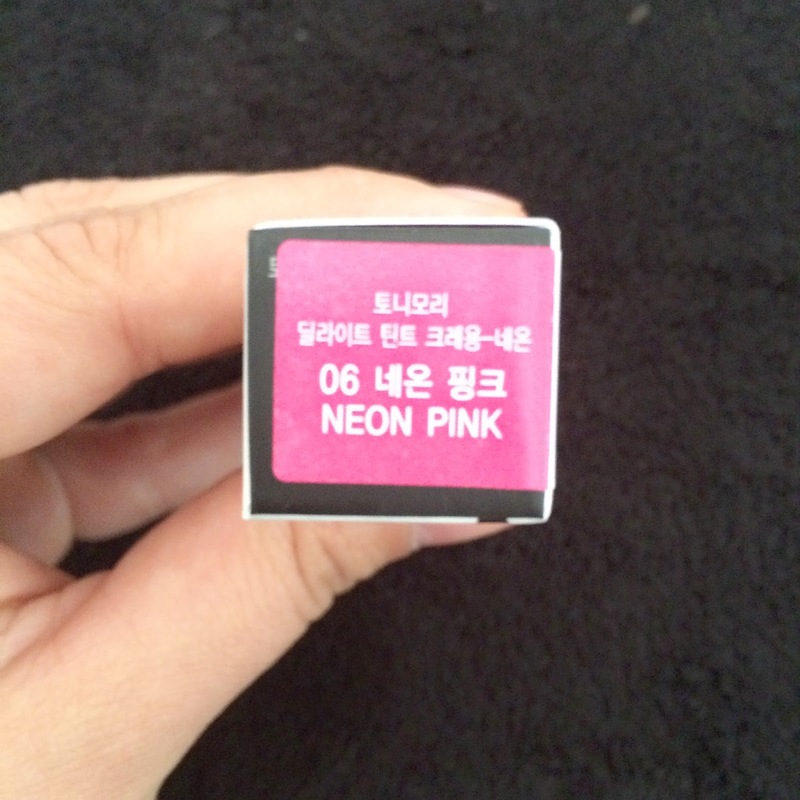 The 3rd ingredient on the list is ranked 5 out of 5 as a comedogenic ingredient. Despite being highly prone to producing acne, this mask made my face soft and smooth. 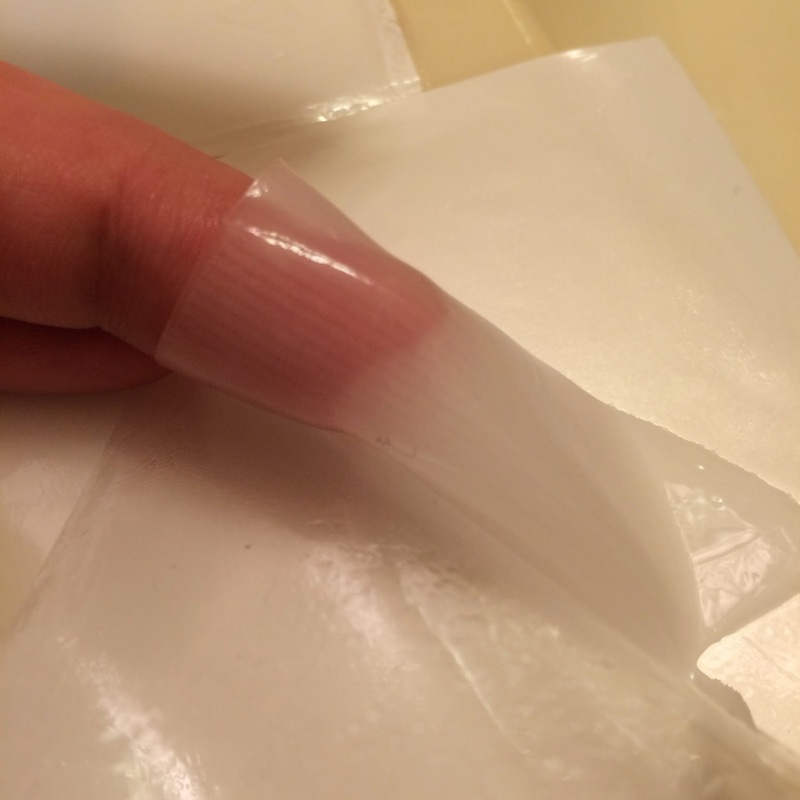 It did have a strong fragrance, but the material was soft and thick, and felt soothing. This ended up being my favorite mask out of the bag. Overall, this was a good assortment of masks! 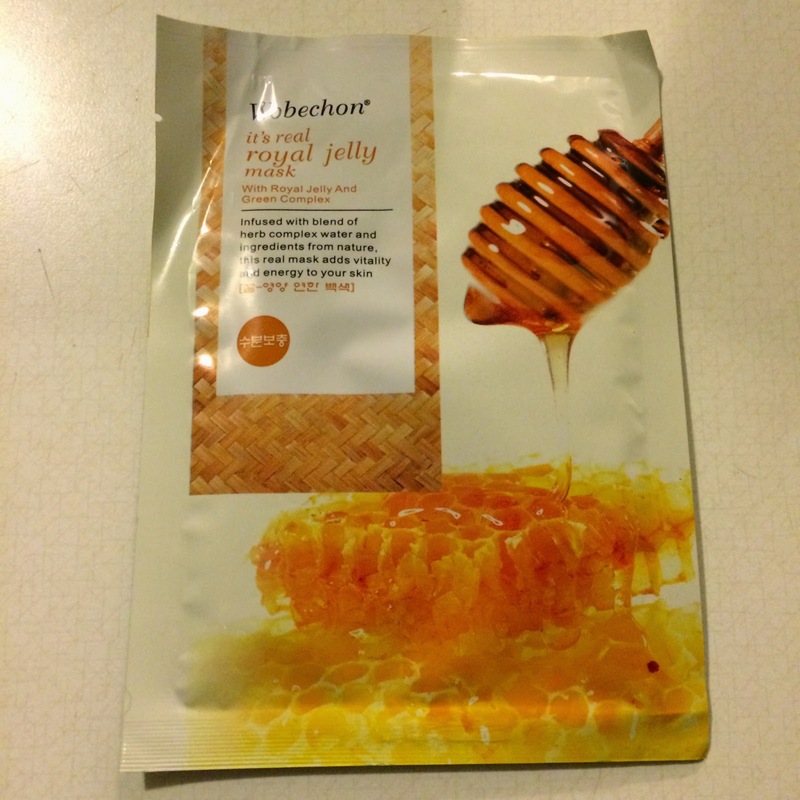 Aside from my reaction to the Blueberry mask and the oily residue left on my face from the Snail mask, I truly enjoyed the Royal Jelly mask and Mushroom mask. 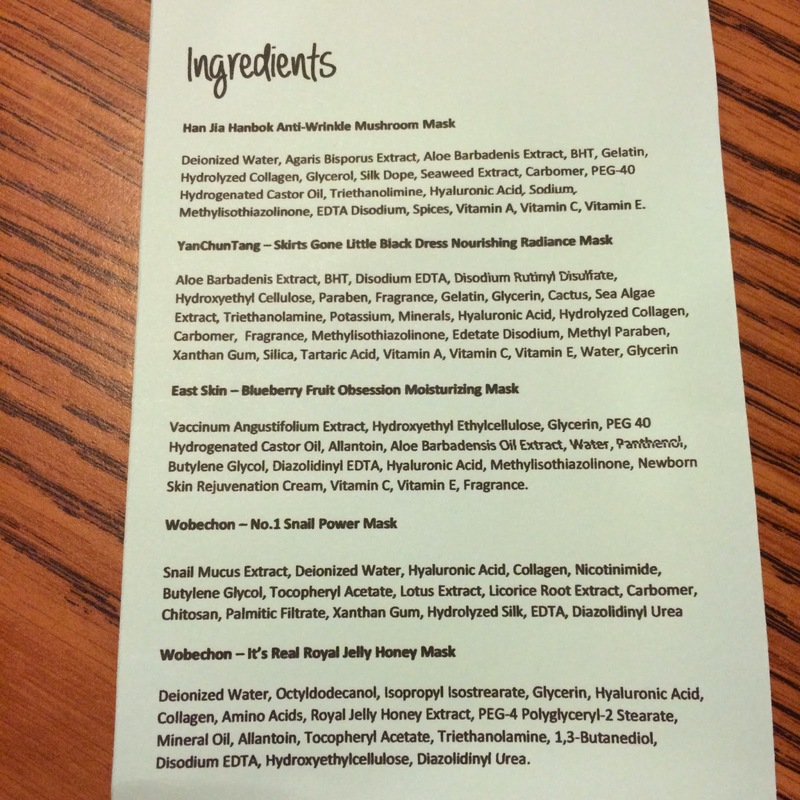 I am however slightly disappointed that besides a card of ingredients, there is no other information about the masks. 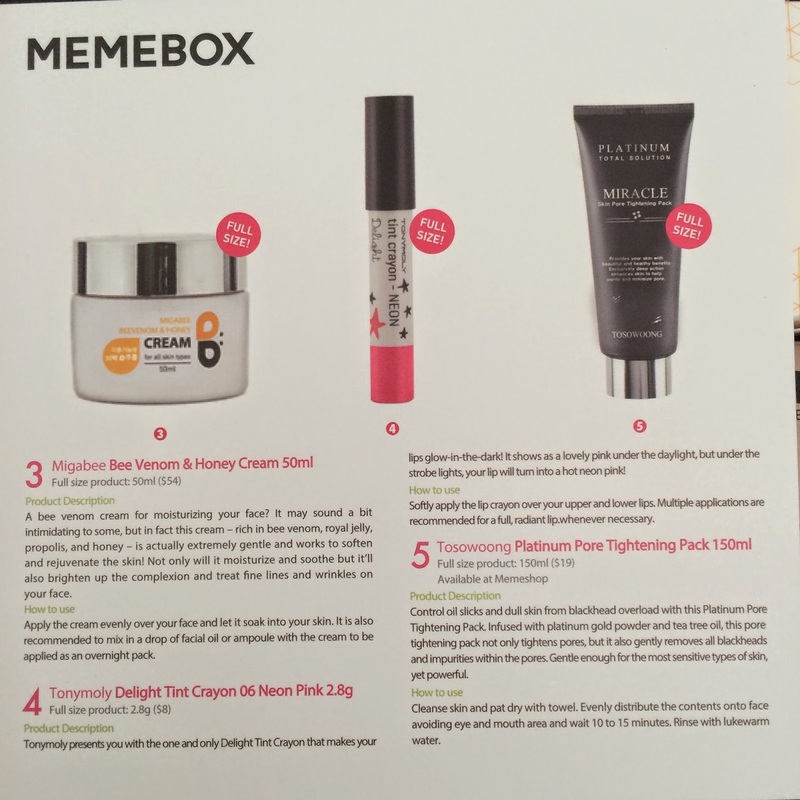 Maybe I'm spoiled by Western subscriptions and my beloved Memebox, but I do enjoy knowing about the brand I'm trying and having some information about the products I'm trying. I appreciate the brief labels on the ingredients card, but actual information about the mask itself with the full brand and name of the mask would be a huge winning point for me. My final qualm about this subscription is the lack of diversity which was initially promised before I subscribed to Oh Sheet Mask. 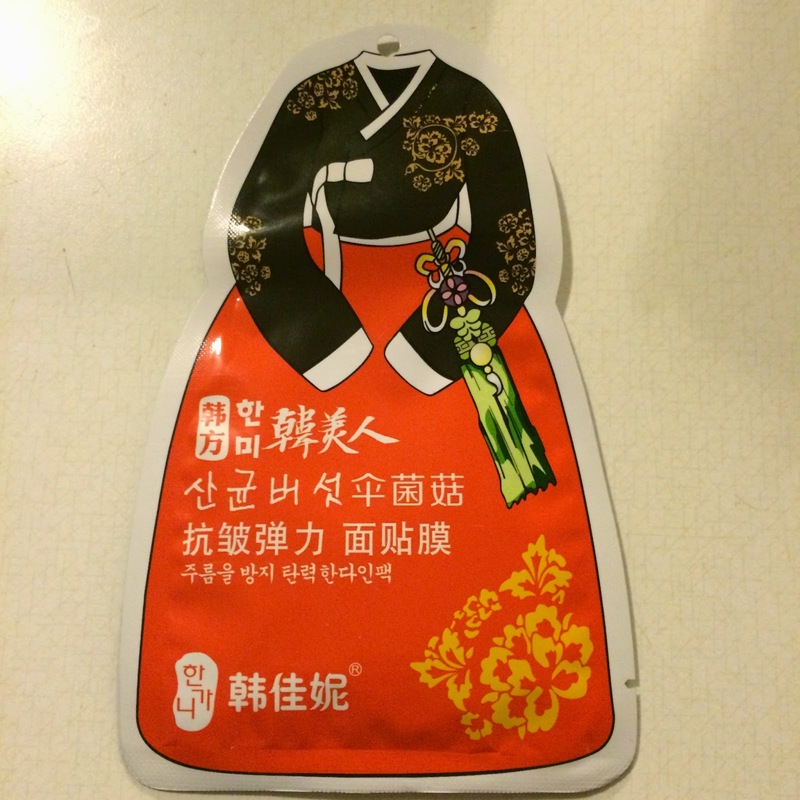 Unfortunately, instead of receiving masks from "Korea and beyond," Oh Sheet Mask currently only sent out sheet masks from China. 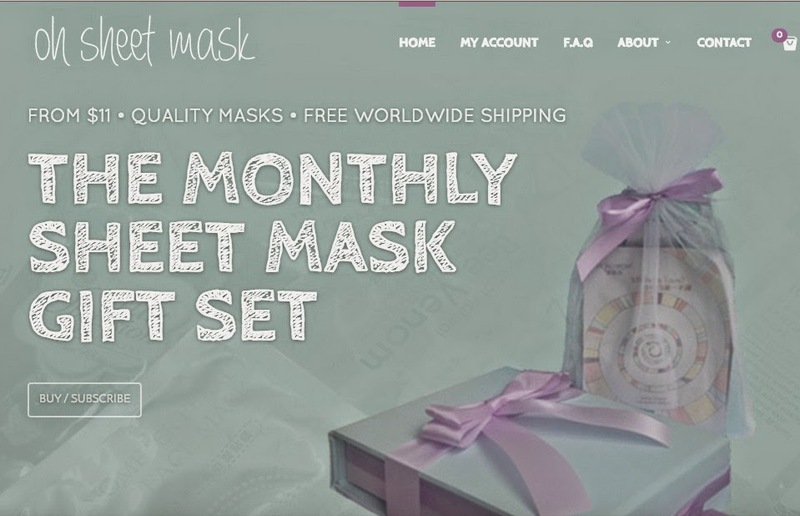 I purchased this subscription on the basis that they were offering high quality, new and innovative masks from Korea along with other asian countries on top of the skincare empire. So their website was a bit misleading. While I enjoyed a couple of these masks very much, I did cancel my subscription. 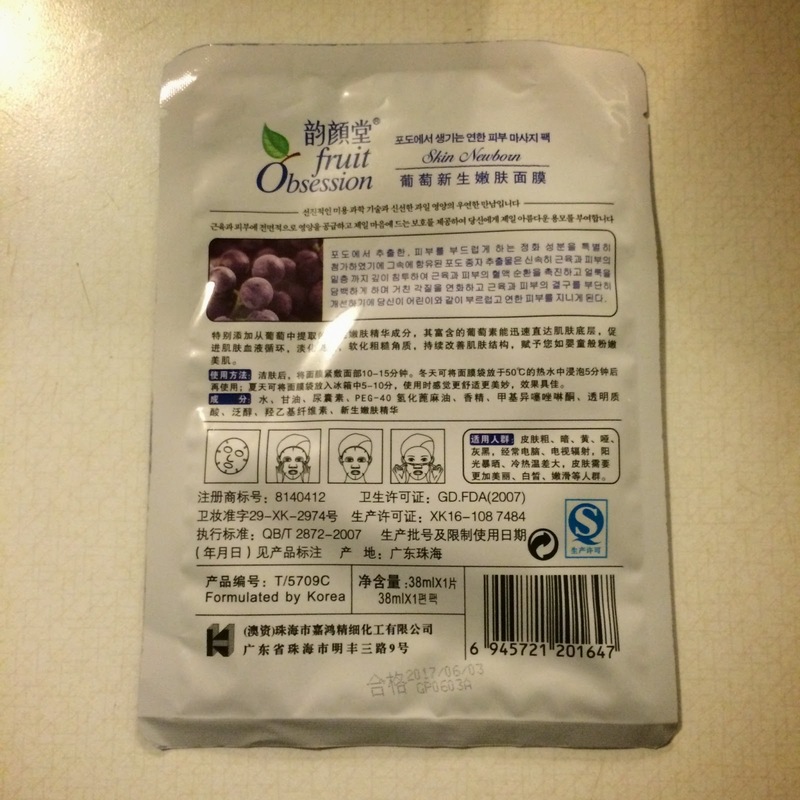 Knowing not all manufacturing facilities in China are on the up-and-up, I did reach out to Oh Sheet Mask to ask about the safety of the masks received, and I personally feel the response I received was a bit rude (telling me that my question was naive instead of trying to be reassuring). Leaving my concerns about customer service aside, I am simply just disappointed in the lack of high quality and innovative masks that were initially promised. Maybe my expectations were too high? 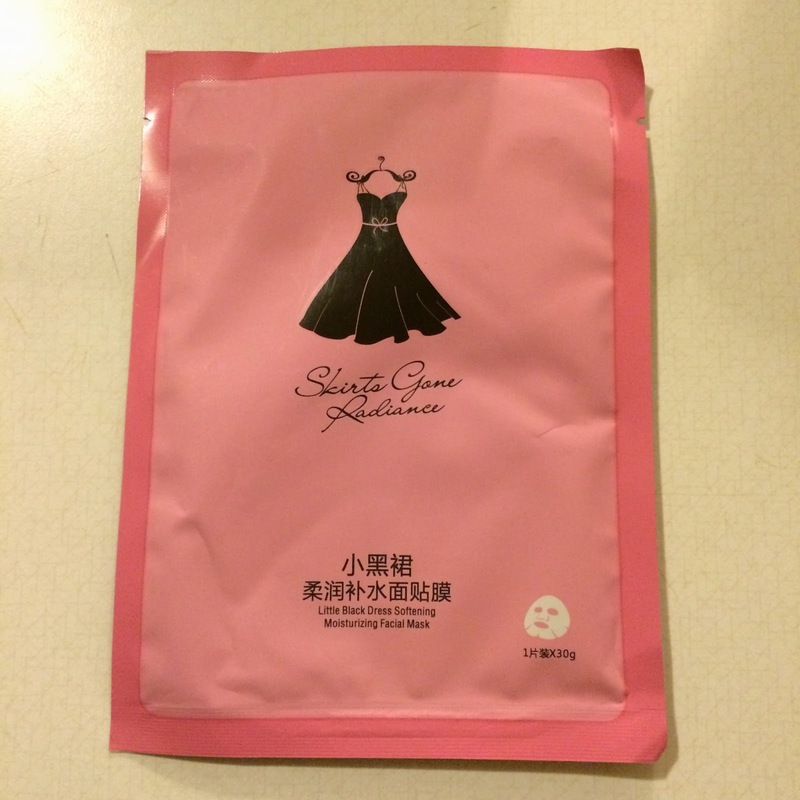 I do hope in the future Oh Sheet Mask is able to branch out and send out a more diverse sheet mask offering to it's customers, but I'll be taking a break for now. As we enter the holiday season, it seems we always take extra time to reflect the things we're most thankful for in life and compile our memories of the past year. 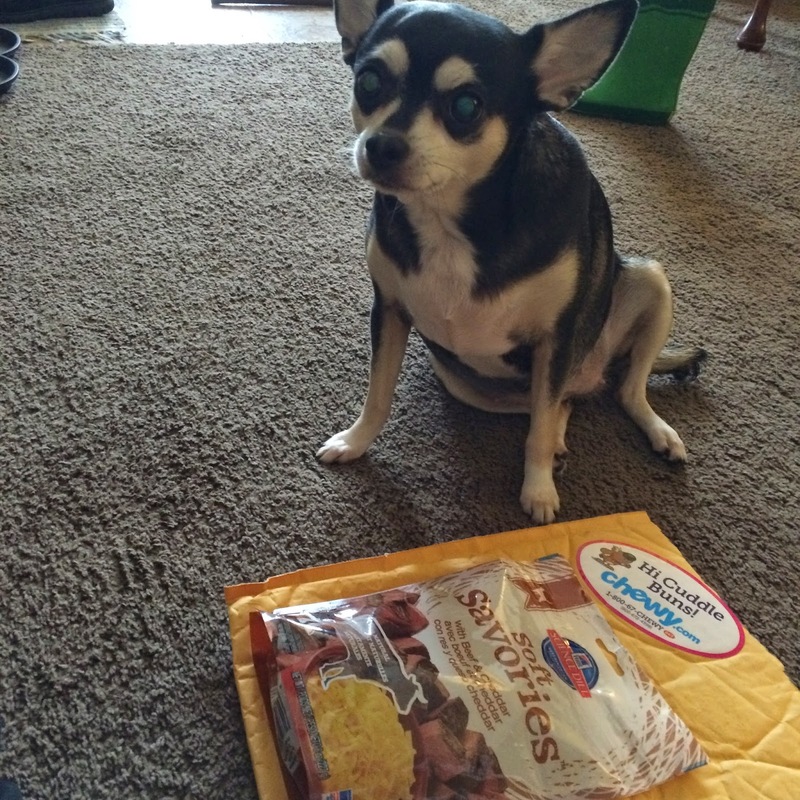 This month, Chewy.com sent out treats to show our pets that we're "Thankful for You." As I reflect on my past year, I'm thankful for the love of my life, and father of my son to have recovered so quickly from his stroke and be able to return to his passion of driving truck and be able to continue his long and active life with his family. I'm thankful for the son we were able to have together - after accepting we would be unable to have children, Gabe nears his 4th birthday (in January 2015). I'm thankful for Venus, our first baby who brightens up every day and is a constant reminder of unconditional love. As I experienced my first loss of a pet, I am also thankful for Ocean. Our sweet baby girl only spent just over a year with us, but the love we shared with her was unlike any other. She was never too tired to cuddle with Jer or I, and even spent a lot of time with Gabe (something Venus will rarely do). Ocean was the family pet we had always dreamed of who never barked, always wanted to cuddle, and always showed her love for those around her. I am so grateful for the short time she was able to spend with us, and our hearts will always be filled with the conflicting pain from her passing and joy from her companionship. This Thanksgiving, show you're pets you're thankful for them. The founder of Hill's Pet Nutrition, Dr. Mark Morris Sr., was one of the first veterinarians to understand the connection between food and companion animal health. In 1939, he developed breakthrough pet nutrition to improve the health of a Seeing Eye dog named Buddy. Seventy years later, they continue to follow the example. 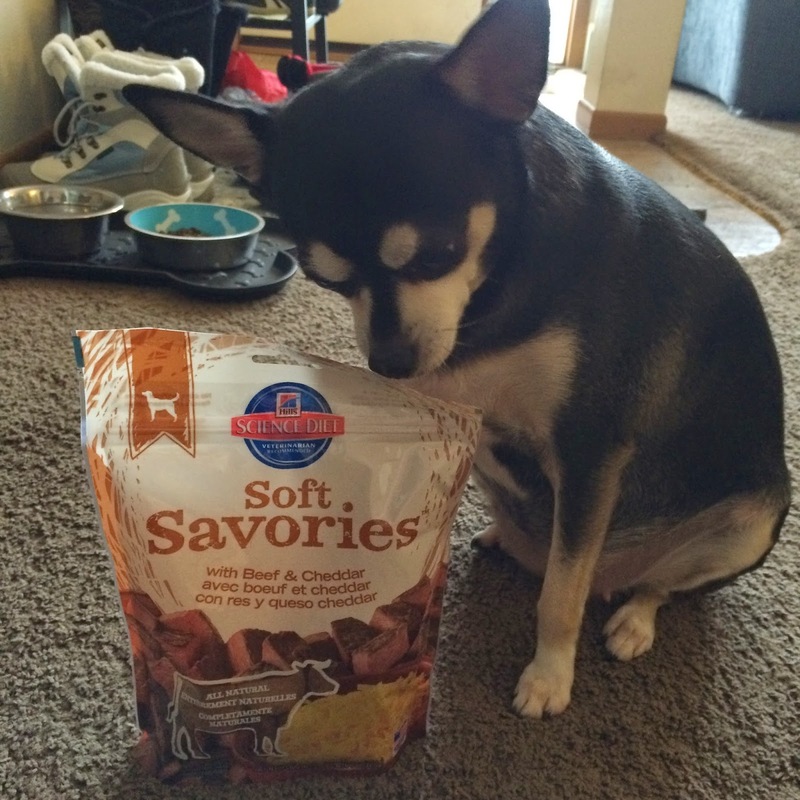 Hill’s pet foods are made in their own U.S. facilities with ingredients from North America, Europe, Australia, and New Zealand, which exceed industry standards for purity and nutrient content. 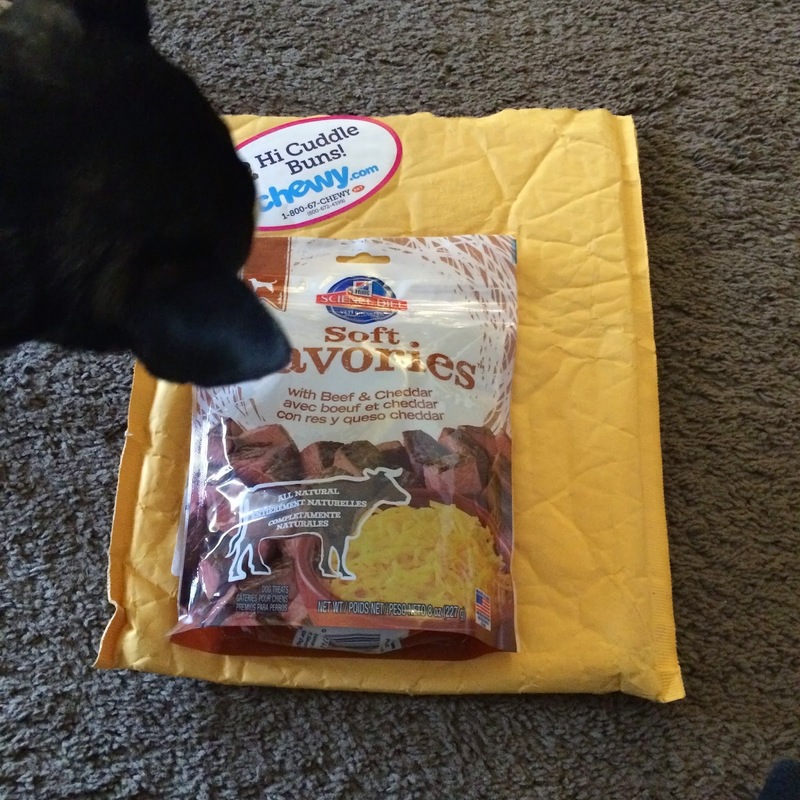 Now with this new line of treats you have 3 great options for your fur babies such as, Beef and Cheddar, Chicken and Yogurt and the yummiest sounding one, Peanut Butter and Banana, YUM! 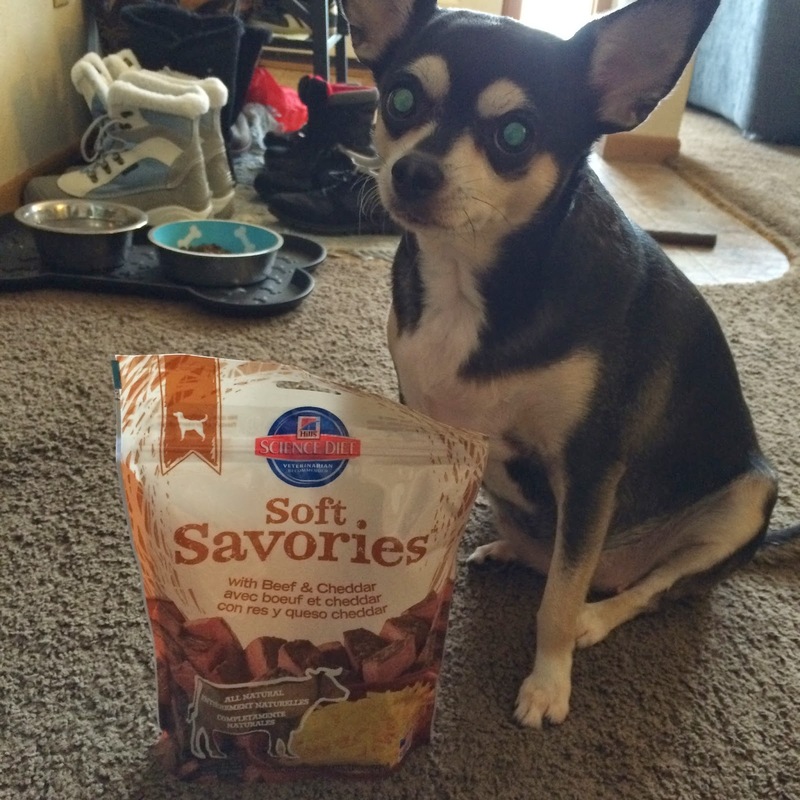 Venus received Science Diet Soft Savories in the flavor Beef and Cheddar. 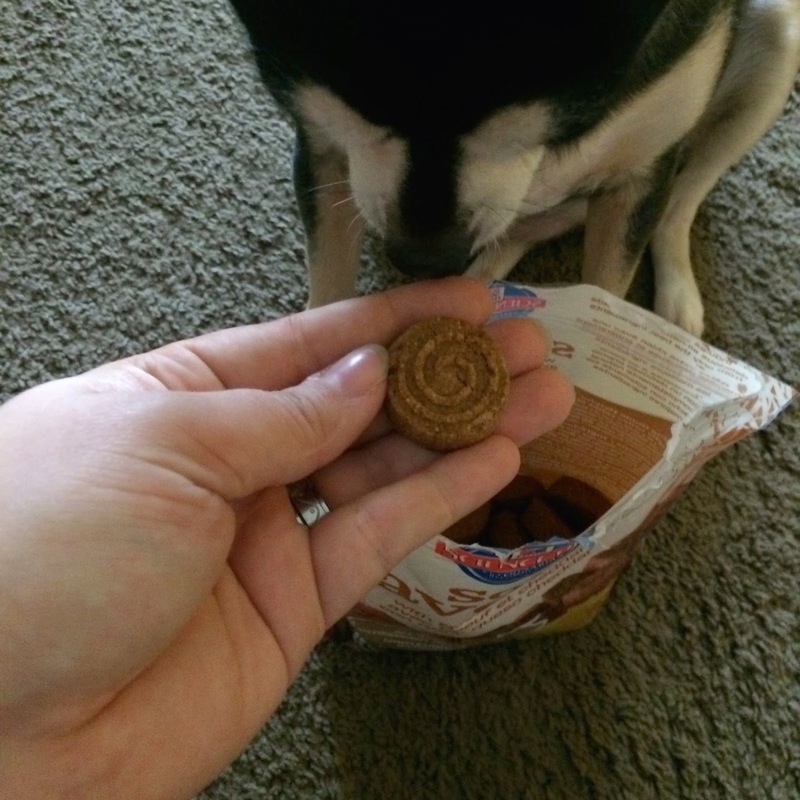 Despite the name, these treats are actually pretty hard. They smell like real beef and cheddar, which beckons Venus every time I open the bag. 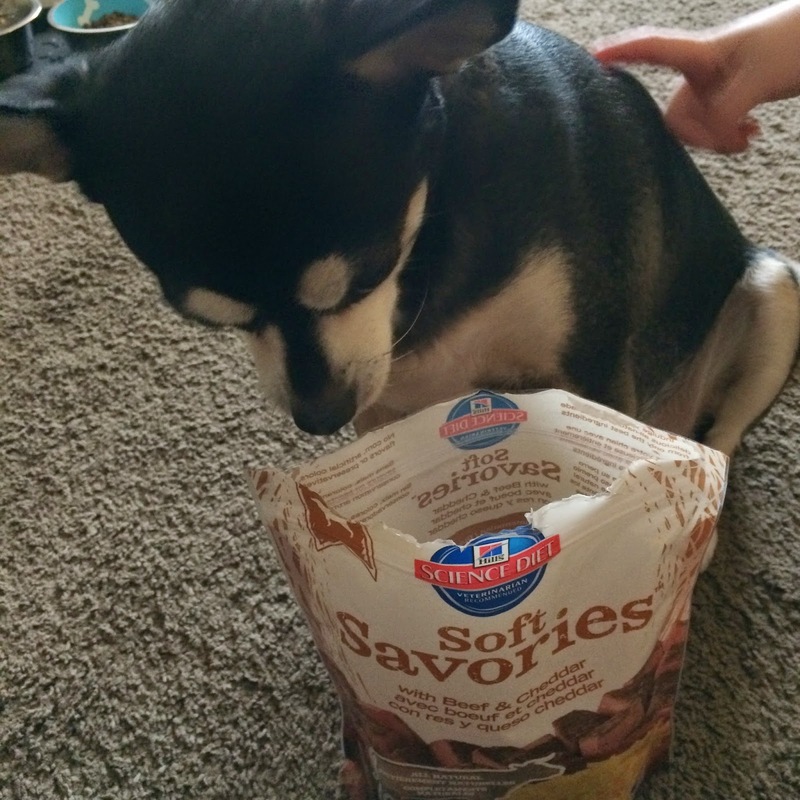 Made without corn, artificial colors, artificial flavors, or preservatives - Hill's Science Diet Soft Savories are the perfect treat for any poochy pal during Thanksgiving, or any time of year! Never miss an update by following Chewy on Facebook, Twitter, and Instagram; and Science Diet on Facebook, Twitter, and Instagram. 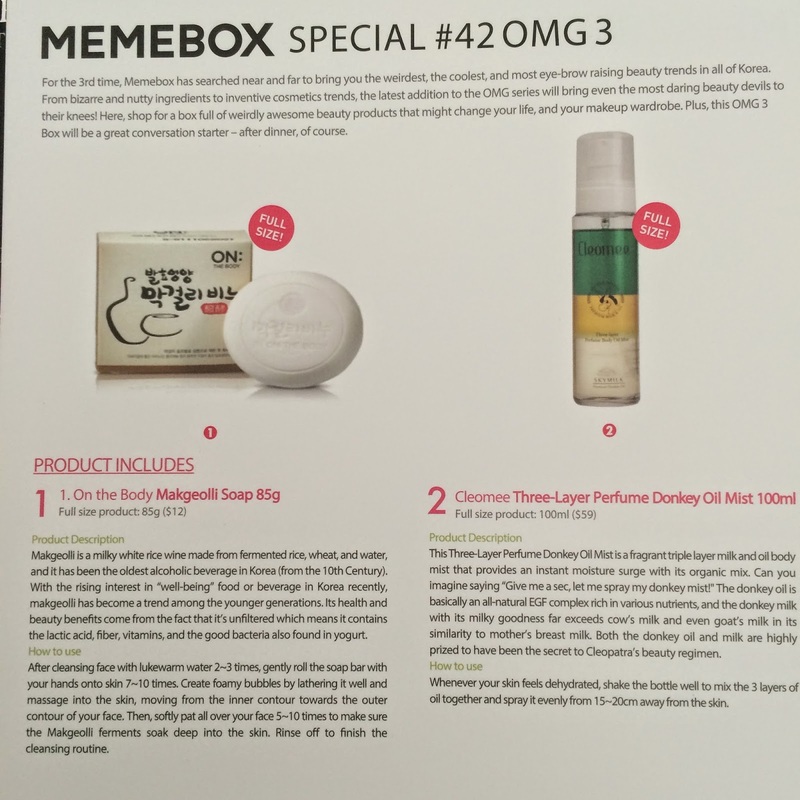 Memebox is not just limited to boxes, they also have what is called the "MemeShop," and recently they branched out into producing their own brand of items to sell in the shop. 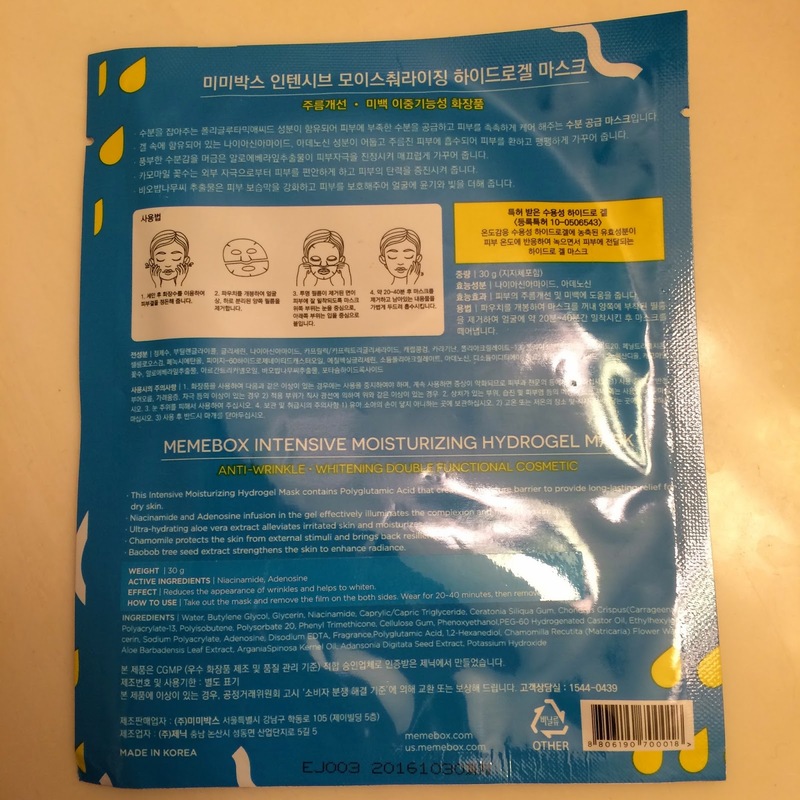 This past week they released the Meme Mask, which is a hydro-gel sheet mask. 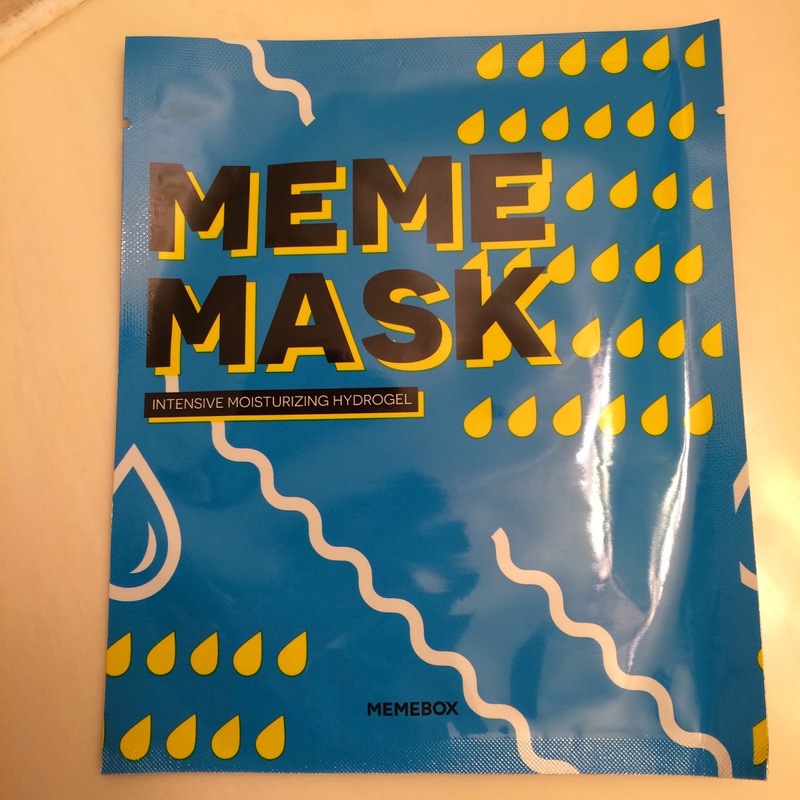 I purchased some to try myself because a) I love Memebox, b) I love sheet masks, and c) the whole concept of gel masks is totally intriguing to me. 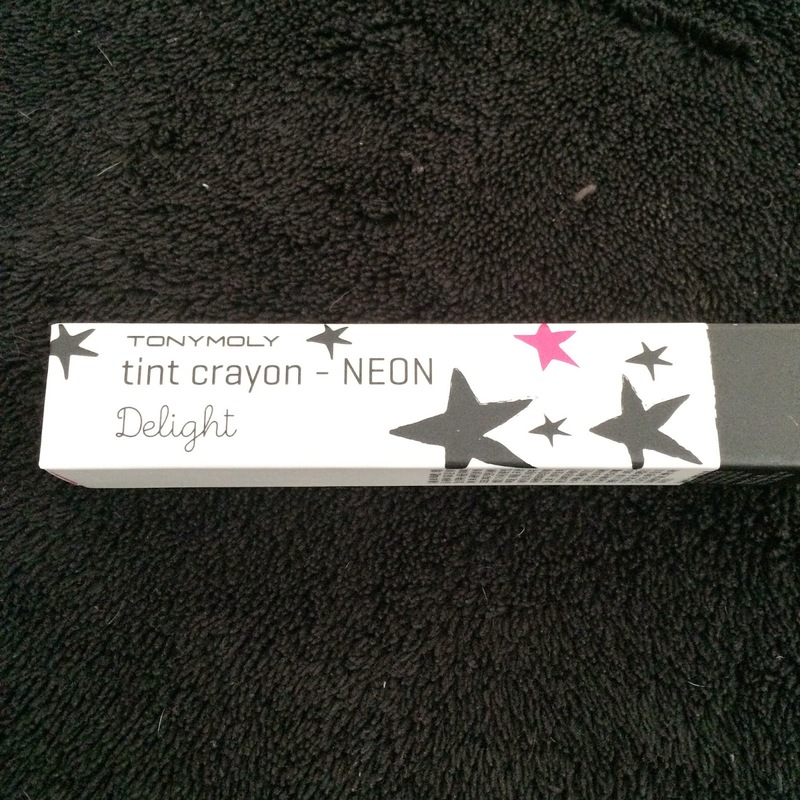 I love the clean, fun looking packaging! This unique hydro-gel makes the mask more moisturizing than a regular paper sheet mask and allows 10x further penetration of hyaluronic acid into the skin ensuring moisture and nutrients are locked into the skin. It provides benefits of anti-aging (with hyaluronic acid and adenosine), brightening & correcting (with niacinamide), and hydration. 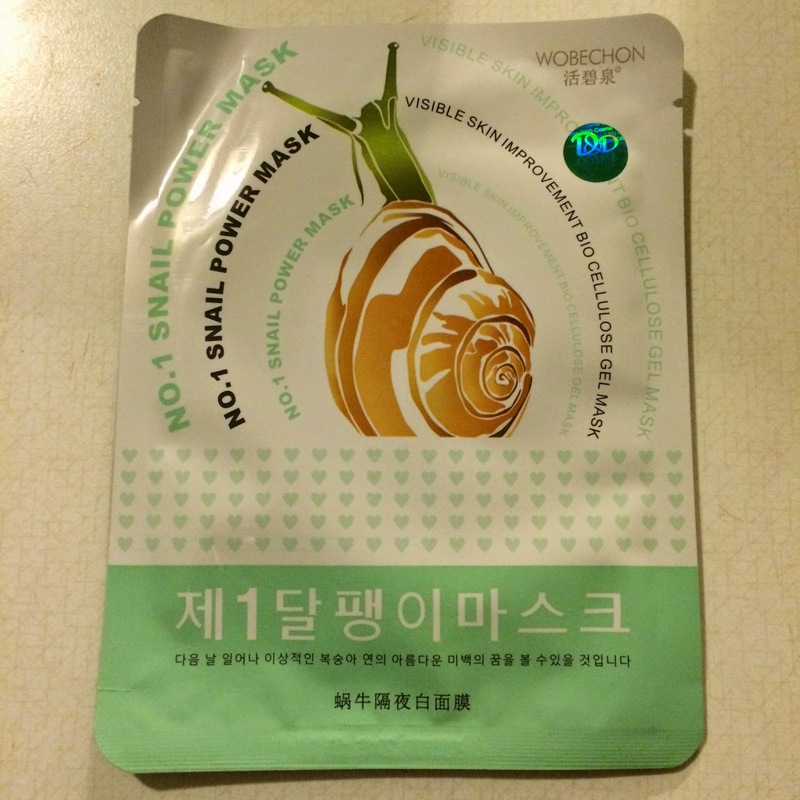 The mask also contains aloe vera leaf extract (for elasticity and moisture), baobab extract (for tightening, toning, moisturizing, and cell regeneration), and chamomile extract (for collagen production). 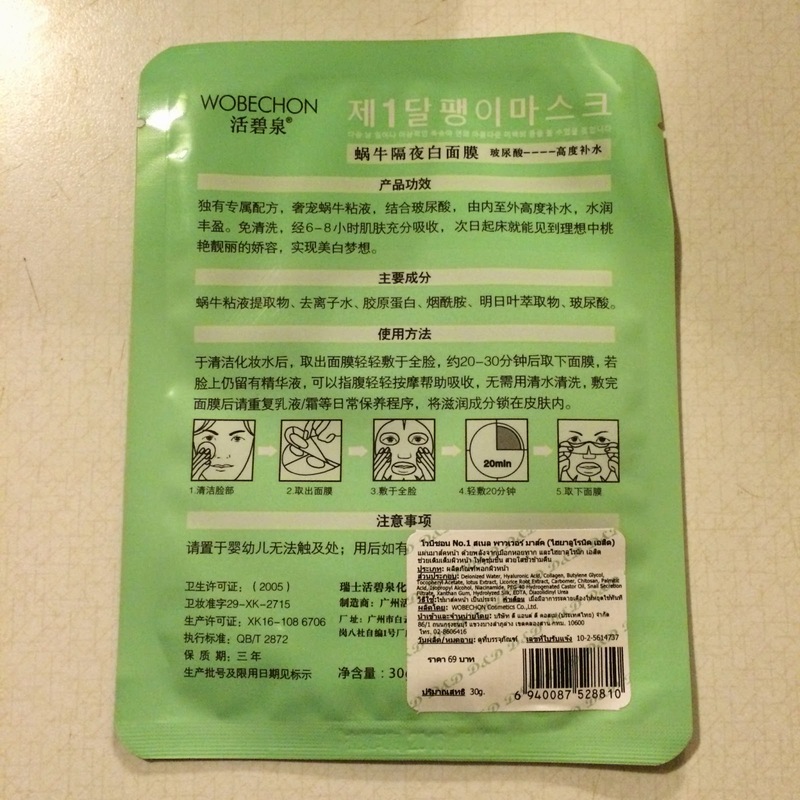 The back of the envelope lists instructions and ingredients in both Korean and English. The 2-piece mask allows for a better customized fit onto the face. 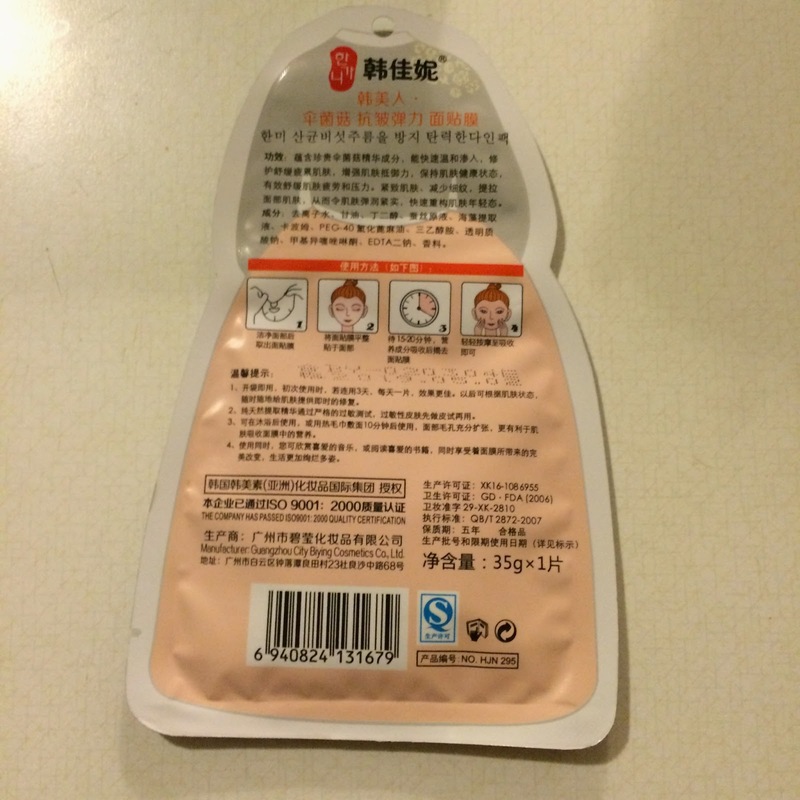 This gel mask is reinforced with a special layer between the gel to allow more stable handling of the mask. The lower half of the mask fits my face perfectly, but can be pulled a bit for bigger faces or smushed for smaller faces. I can't get over how flexible and squishy this mask is! Both pieces! I need to work on the top piece a bit more bit I think the middle nose strip could be a little wider and the top piece itself a little wider as well to cover better. I love the soothing scent of the mask, maybe it's the chamomile I'm smelling? It's fresh and calming. 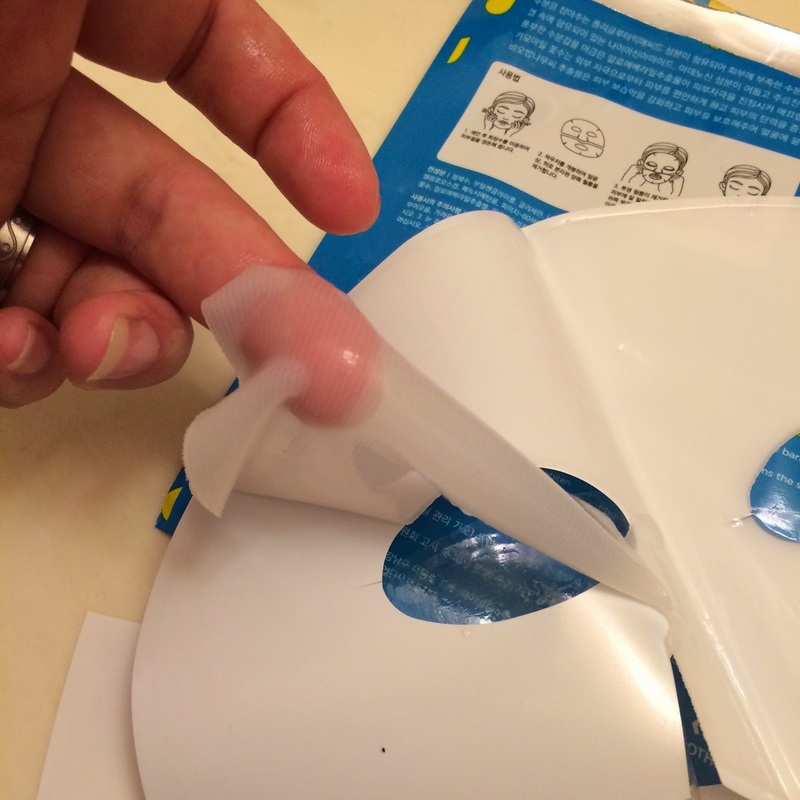 The mask really does feel like gel, but if it folds in on itself it's easy to pull apart and fix, it doesn't tear easily. 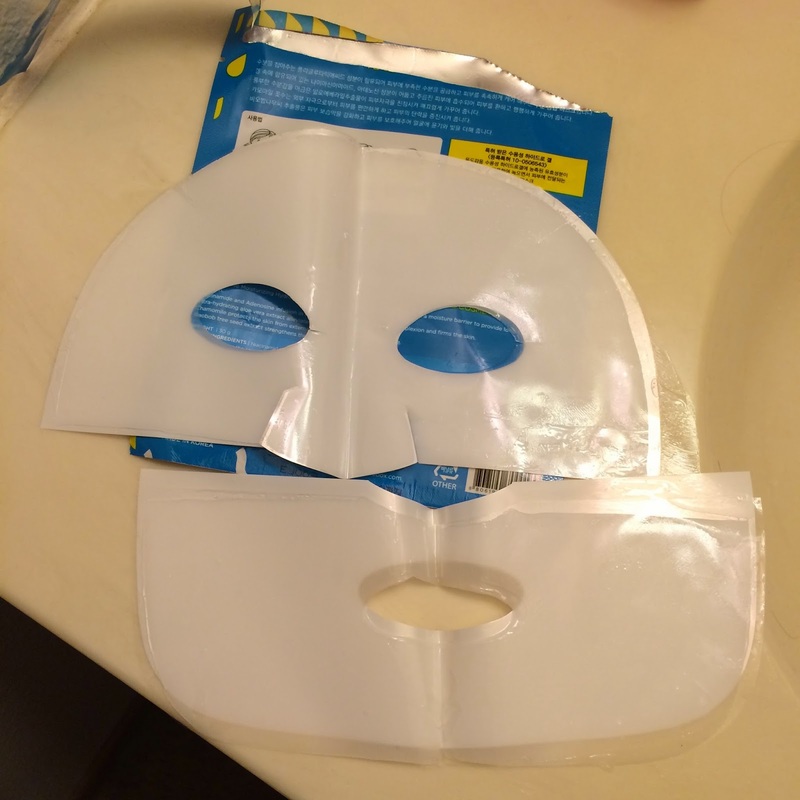 The mask is sandwiched between two plastic sheets in the envelope, and is easy to separate. 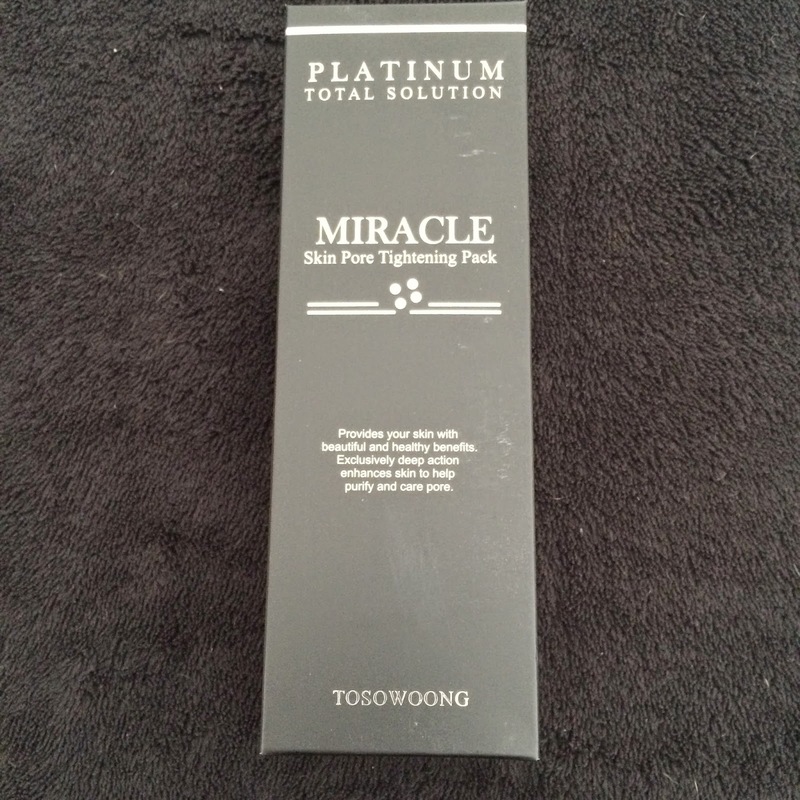 The mask is immediately cooling on the skin, and helps reduce puffiness. The cooling effect lasted the whole time the mask was on my face, and it made me feel like it was drenched with moisturizing gel, but it was hugging my face and not sliding off anywhere. My face felt so calm and smooth after removal of the mask. 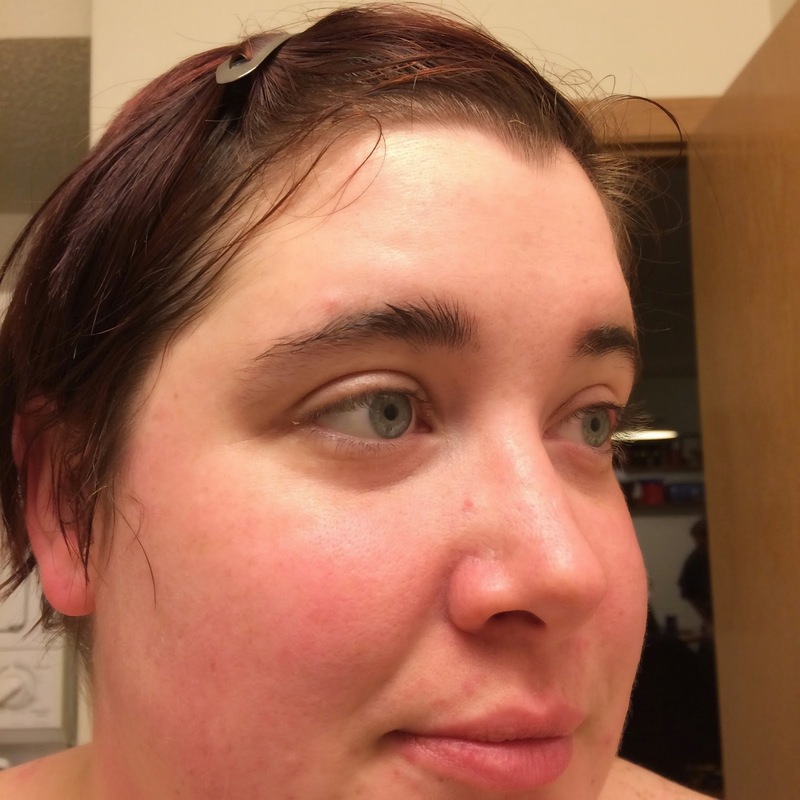 I experienced minimal pinkness in my cheeks (which is normal for me, but even less than other masks I usually use). The moisture to my skin was phenomenal, no creasing or puckering of my skin when pressure was applied. 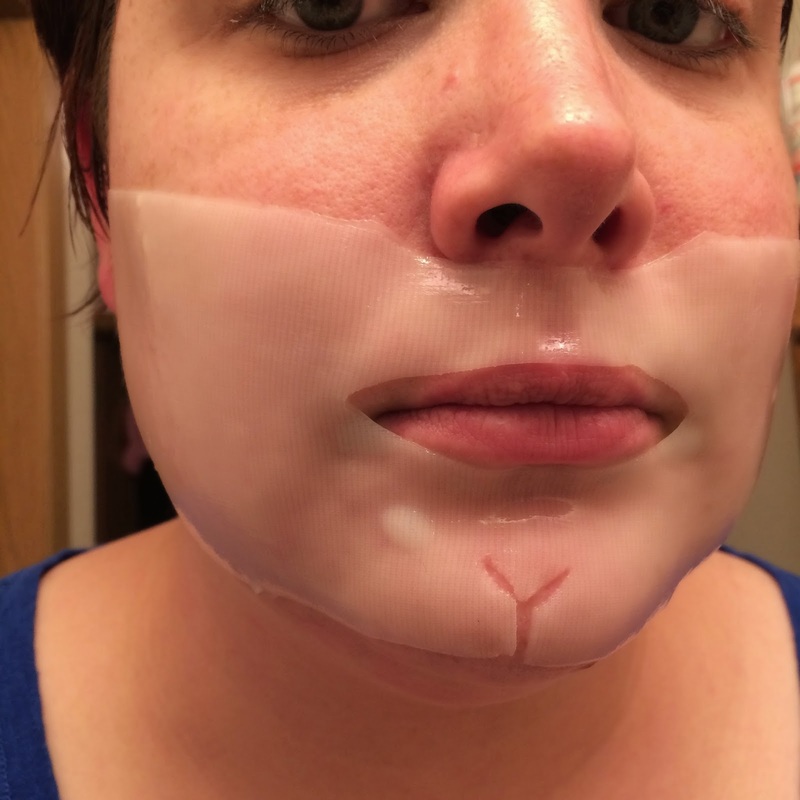 After I removed the mask, my face felt incredibly plump and smooth. 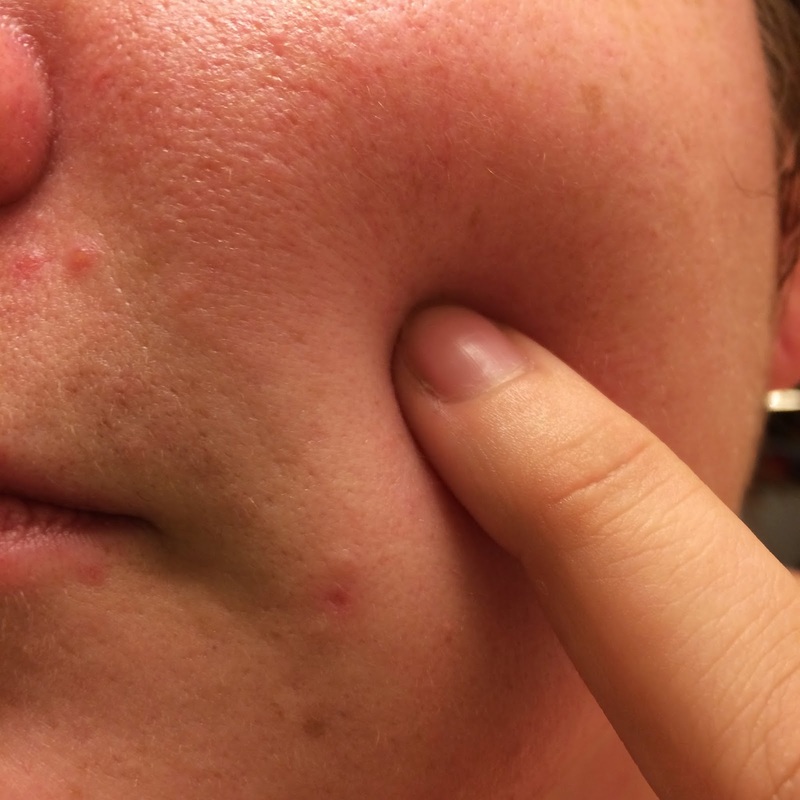 My acne looked more calm than prior to application, and my face felt moisturized but not sticky or oily. 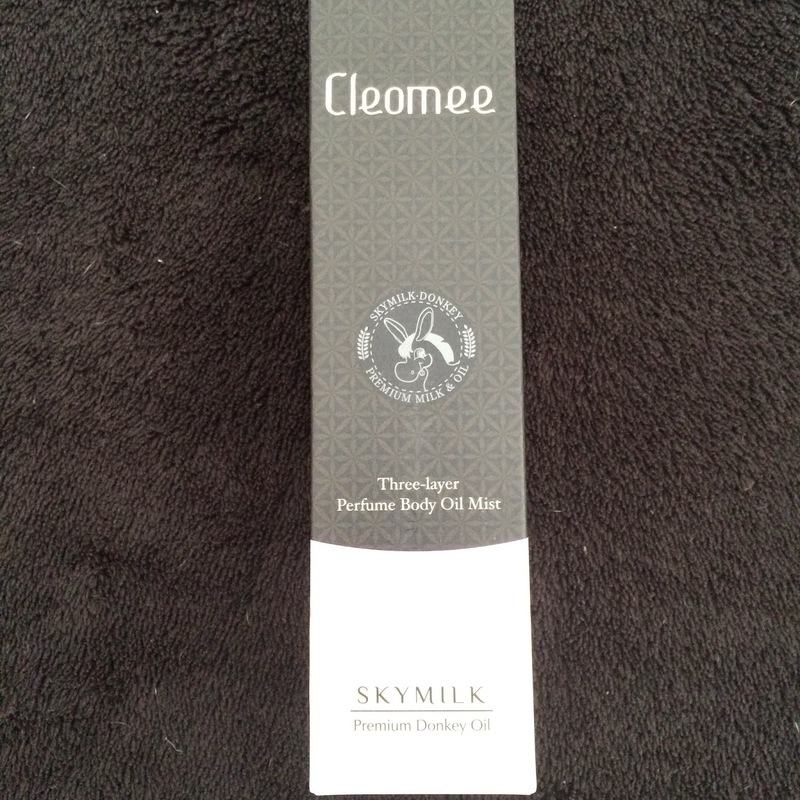 It did not aggravate my oily skin at all or cause excess oil to be produced. I feel like these masks would be good for any skin type. After using the Meme Mask, my night got really hectic, and I ended up skipping the rest of my skincare routine for the night; no moisturizer or serums afterwards. I expected to have dry cheeks when I woke up and an oil slick on my nose for not feeding it some good moisture - but my face seemed to have held onto the moisture from the mask all night. My face looked nice and bright in the morning, and my face still felt smooth and moisturized. This may not be the case for excessively dry skin, but for my oily skin, it's good to know how much moisture this little mask really holds. Overall, these masks were a great purchase for me. I'll be including some in my upcoming holiday giveaway (hint, hint). I'll definitely be repurchasing these for my own personal stash.